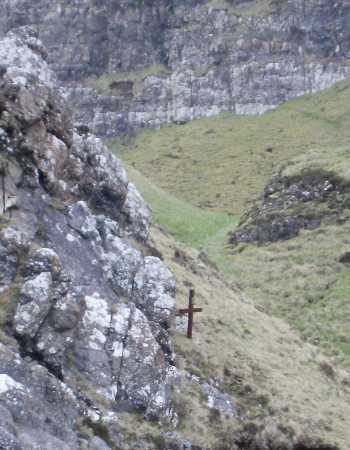 Picture from tyfan : Cross at mountain crash site. Picture: Cross at mountain crash site. We climbed Binevenagh from the track at the corner of St Aidans church grounds, this narrow track climbs steeply and crosses a forest road, continues through the forest and exits at a wooden stile ( 15 mins ) and there we turned left. At this point you can see the grandeur of the Binevenagh area. We followed the path round clockwise, up to the top of the cliffs, past Binevenagh lake and followed the path over a metal stile and down a grassy valley completing the circular walk. On our way back we stopped at the cross marking an RAF plane crash, the cross lists the names of nine crew members who were killed in the crash. Elevation 265 mts IC 68497 ITM 30652.